Electacourse are the leading publisher of training and learning support material for UK electricians. We have been in business for over ten years and are proud of our record for providing high quality, good value and convenient courses and training support material. In this period tens of thousands of students have used our low-priced, self-study courses and exam simulators to achieve exam success. Whether you want to study only in your own time, or want supplementary material to complement your college or training course, Electacourse are likely to have something for you. 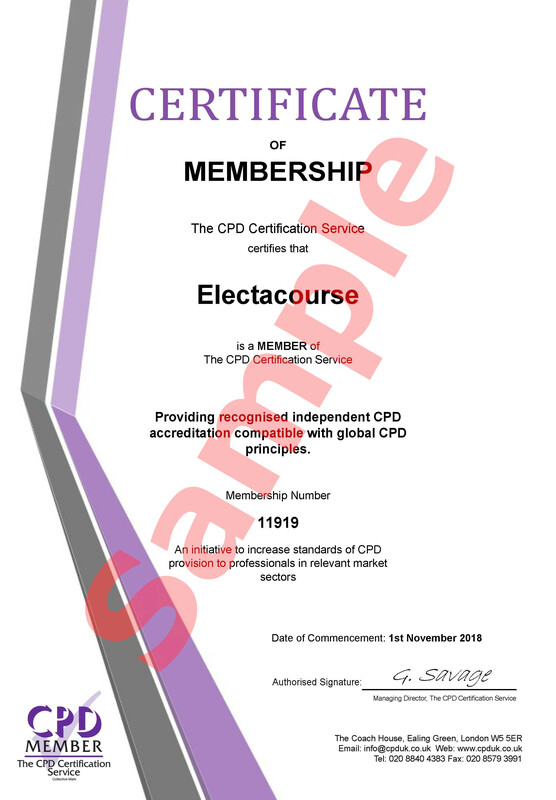 Electacourse have successfully submitted our 18th Edition Online Course for CPD Accreditation. We are pleased that the quality of the course has been recognised and we are able to offer the CPD Accreditation Certificate on successful completion of the course. All our courses, exam simulators, exam practice and training material is available to FE Colleges and Training Companies for you to use in your training provision. We can offer competitive prices which makes it more beneficial for you to use our material rather than go to the expense of creating and maintaining your own material. Our skill is publishing and content development. We strive to make our material always accurate and up-to-date. Your skills are training and professional development, together we can offer your customers the highest quality learning experience. For nearly all our FE college and Training Company customers we can develop your students’ online experience so it is delivered within your branded environment. Building on the incredible success we have had when in 2013 Electacourse launched the first online 17th Edition Course, we are have published the best-selling 18th Edition Online Course. At just £140 there is no more cost-effective way to keep up with the new BS7671 Wiring Regulations. With our focus on exam success, we have helped thousands of electricians achieve the essential Wiring Regulations, City & Guilds 2382 exam. Nearly all Electacourse products are delivered online. We no longer have to invest in the cost and time of printing and shipping books. Now, all our products, with the exception of the Electacourse exam simulators (which are downloadable computer apps) are available only online. Our customers have the benefit of being able to access their courses and exam practice whenever they are online and from any device. We do not sell our Exam Simulators through the App Store – at an Apple service charge of nearly 40%, we prefer to keep our prices low and just don’t think it worth handing over nearly half your money to a third party.